DUMBARTON thoroughly failed to live up to their ranking as 'best part-time team in Scotland' when they crashed out of the Petrofac Training Cup at trim Stair Park in Stranraer. This first round tie, played in steady light rain, ended in a 3-2 defeat for Ian Murray's men — exactly as last year's first round tie at the same venue ended. The pattern was similar too. The visitors, playing some classy one-touch football, went a goal up in the first five minutes when a Jordan Kirkpatrick shot was dummied by Mitch Megginson and ended up in the net. The fancy stuff continued for a little while, but the home side came more and more into the game and began to dominate. 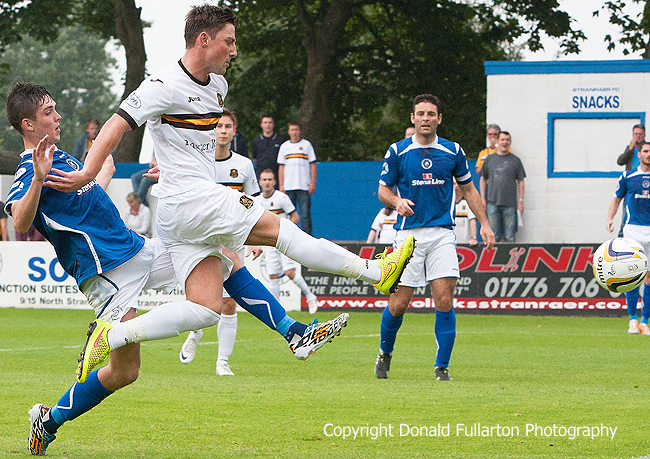 But a fine solo effort by Mark Gilhaney just before the interval gave Sons an undeserved 2-0 lead at the break. New signing Archie Campbell was introduced at half-time, and in the first few minutes the pacey striker came close with a header and then a shot. But back came Stranraer, just like last year, and they took charge against their more illustrious opponents who at times looked bemused. Two goals by defender Frank McKeown gave them equality, then deep into injury time Sean Winter — the hero of their humbling of Dumbarton last year — did it again, firing home the winner. There was just time to restart before referee Des Roache blew for full time to the delight of the home crowd. The picture shows Jordan Kirkpatrick firing in a close range shot in the first half.